Windsor County is situated in southeastern Vermont above Windham County. 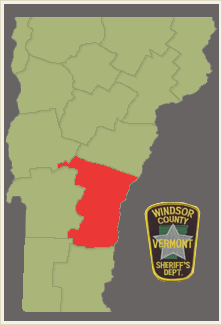 Windsor County is Vermont's largest County in size at 927 square miles. Vermont history has recorded that counties were set and defined by the needs of a Probate District according to growth and population. This resulted in multiple probate districts. In 1779 there were four probate districts in Cumberland County (Guilford, Rockingham, Windsor and Barnet). In 1781 Cumberland County was abolished and the counties of Windsor, Windham, and Orange were formed. Windsor County was incorporated on February 21, 1781 and its shire town is Woodstock. The establishment and election of Sheriffs for their respective district is found in Chapter II "Plan or Frame of Government" Section 50 of the Constitution of the State of Vermont. 1781 - Briant Brown (Windsor, Vermont) was the first elected Sheriff of Windsor County but resigned immediately after to become a Windsor County Clerk. 1781-1782 - Ebenezer Brewster (Dresden, NH) was appointed to replace Briant Brown.